So I decided that instead of fighting with them by myself in the garage again I’d go down to the Bike Kitchen so I could use some proper tools and maybe get some advice on how to fix my brakes properly. 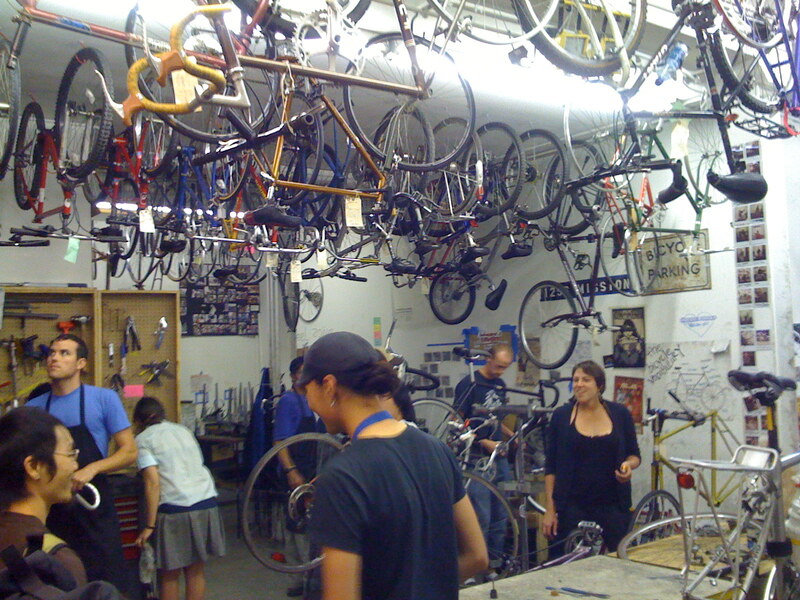 If you haven’t heard of if before, the Bike Kitchen is a do-it-yourself bike shop; they provide the space and the tools for you to work on your own repairs, with some assistance if needed from their mechanics. For a measly $5 it’s much cheaper then taking your bike to the shop and you learn how to take care of simple maintenance tasks yourself. It as pretty busy the evening I went down there, lots of people fixing their bikes, a few building their own bikes from old parts and even an out-of-town couple who just came to have a look. I got my brakes sorted (really I think all I need to do this at home is a decent bike stand) and pedalled happily home. Bike Kitchen is by no means the only operation of its kind—a friend of mine runs the Bike Station in Edinburgh and there is a (I believe) unrelated network of Bike Stations here on the West Coast. -btw ♥super cute picture of you over at the velvogue!! What a cool idea- Here, I’d need to be a trained mechanic to run a bike shop, but this gets around a lot of the regulations and helps people get new skills. Thanks for the post.